The DotA 6.77 AI 1.1.7 Fun 2.7b map has been released. This map is a modified/enhanced version of official DotA 6.77 AI which contains 45 extra heroes and items just for fun. It contains Old Lifestealer, Silencer, Cloud Strife, Spongebob and other new concept heroes. Also, there's a shop with ultra-powerful item recipes. 45 more heroes with epic skillset. Santa Hat from killing sprees. Added ND Mode, It'll make you respawn instantly. Santa Hat in killing spree. Terrain Snow while playing fun mode. 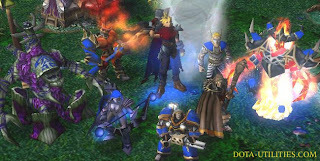 * Download the map (.w3x) file and copy it to 'Warcraft 3\Maps\Download\" sub-directory. Semoga artikel ini bermanfaat bagi saudara. Jika ingin mengutip, baik itu sebagian atau keseluruhan dari isi artikel ini harap menyertakan link dofollow ke http://gadget-windows-7.blogspot.com/2013/05/free-download-map-dota-677-ai-fun-v27b.html. Terima kasih sudah singgah membaca artikel ini.